You walk past a lot of animals in India; cows, goats, monkeys, dogs, camels, horses, elephants… There’s something very evocatively medieval about the blurred lines between town centre and rural hinterland; a boundary that only seems to exist in the very heart of the major metropolises – and even then such animals can still be found. The intrusion of the rural into the urban (or is it the other way around?) brings with it all the scents of the countryside – that rich fug of beast and manure – which seems anomalous to the scale of the towns and reminds me of when the Easter Show used to come to the old Royal Showgrounds in Sydney’s eastern suburbs. Then, every morning, for roughly two weeks, I woke up to the smell of cows, sheep and pigs in, of all places, Paddington. The presence of large animals on the street can be intimidating at times. Mostly they are placid and docile, yet occasionally a narrow passage will be blocked by a cranky bull. Whilst he might exhibit only the most minor irritation – a flicking tail, a restless stamp, a displeasured snort, stung perhaps by a sand-fly – it would be unwise to get into close proximity. Sometimes the condition of the animals can be quite distressing, though generally it was the stray dogs which seemed the most malnourished. Indeed, I was surprised at how robust most of the cows and bulls looked – a little thin at times, but rarely emaciated. 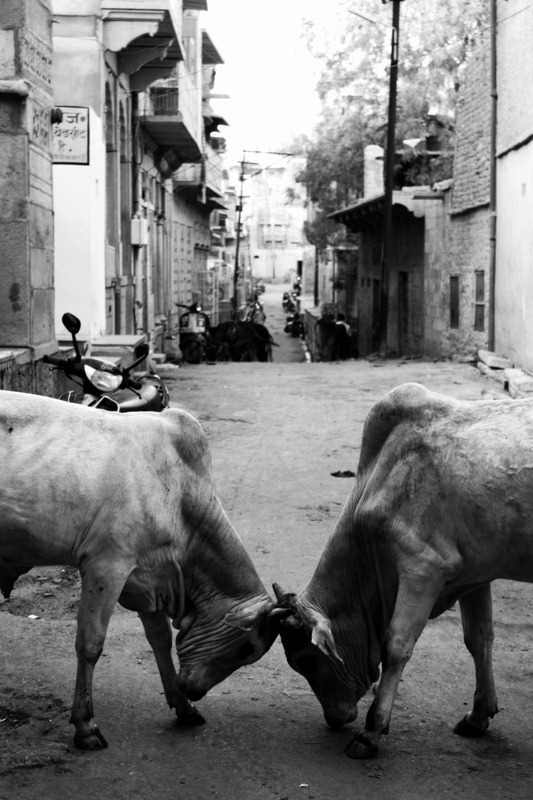 These two bulls were mucking about in the streets of the Jaisalmer, Rajasthan, having a playful wrestle. There was little animus in their proceedings, just a languid and lazy butting practice. It was good of them to provide me with such a symmetrical subject, and indeed they remained like this for some time, pushing slowly to and fro. It seemed the bovine equivalent of a fist-bump; a soft, yet muscular display of power; a subtle reminder that such friendliness could not always prevail – not when the time came to compete for cows.